Why Karate and not Tae kwon do? This is the question I often get asked on why I enrolled my son in a Karate class over Tae kwon do. My immediate answer will be that it is what his father wants. When I asked my husband, he simply says that Karate makes use of both hands and feet while Taekwondo focuses more on the footworks. Our not so little toddler can make use of lessons to further develop his gross motor skills and with him being able to use both hands and feet during the Karate training, this goal will be accomplished. Another basic difference of the two: Karate originating in Japan and Tae kwon do in Korea. True enough, as I read through these articles over the internet, (in between looking into acne products for this persistent zit on my right cheek) that Karate makes use of their arms and hands 60% for strikes and blocks while legs are used for kicking about 40% of the time. This is affirmed to me even as I went over my son’s video of his “kata” during his promotion. Katas are set routines which simulate fighting stances used as martial arts techniques. As opposed to Karate’s routines, Taekwondo makes use of 40% hands and 60% legs. Higher kicks are emphasized as well. As I read through several articles on the difference between the two, I find that Karate is the more “realistic” form of martial arts and what I want for my son. Taekwondo utilizes jumping, flying kicks and airborne kicking techniques that are not normally used during real life self defense circumstances. But it is really a matter of individual preference. Both Karate and Tae kwon do share the requirements of athleticism, stamina and discipline. These are just the basic reasons that influenced our decision of choosing Karate over Taekwondo for our son. Tags: Karate is the more "realistic" form of martial arts, Karate over Taekwondo, kata, Katas, tae kwon do, Taekwondo, Why Karate and not Tae kwon do? 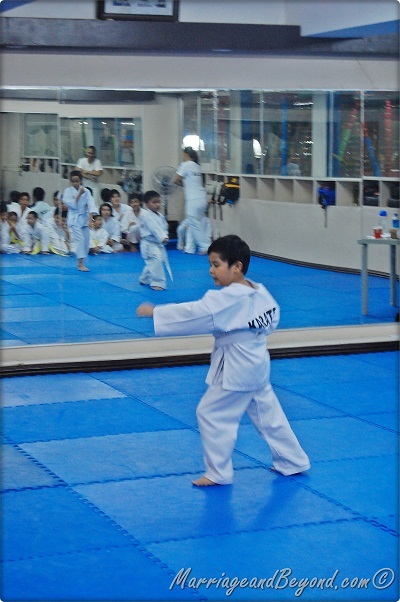 where po yun karate school nya? or can you suggest near Manila/Makati? Thanks.